John reports that "Why did you pick ninja rabbits?" is one of the most commonly asked questions from interviewers and fans on our live chat. For Lugaru, the answer is simple -- back in high school, I thought it would be fun to make a game about my dog Wolfie. This idea evolved into a game about wolves fighting rabbits. 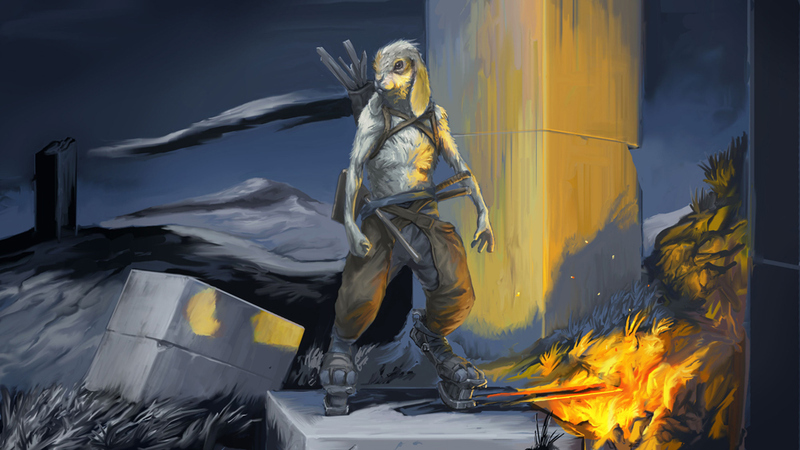 A more interesting question is: "Why did you keep the idea of ninja rabbits in Overgrowth?" Most games featuring melee combat take place in an anime-inspired world of ninjas and robots, or a dungeons-and-dragons-inspired world of barbarians and wizards. It would be very difficult to make another game in these worlds that would explore new territory and provide a new experience. Our setting of animal warriors and ancient monoliths really helps us stand out from other fighting games -- and can make gamers stop and check us out when they first see movies and pictures of rabbit ninjas doing crazy acrobatics. Another advantage of this setting is that it allows us to avoid showing violence against humans, while using human-like martial arts. If we want to make a very violent game without trivializing human violence, using non-human characters is a good first step. 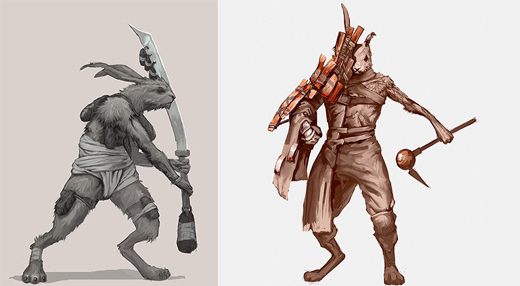 Using animal warriors allows us to tap into our knowledge of real-world animals to create distinct character classes. We all know that rabbits jump high and wolves have big teeth. We can use this basic knowledge to establish complex relationships between the different species' abilities in a way that is intuitive to players. 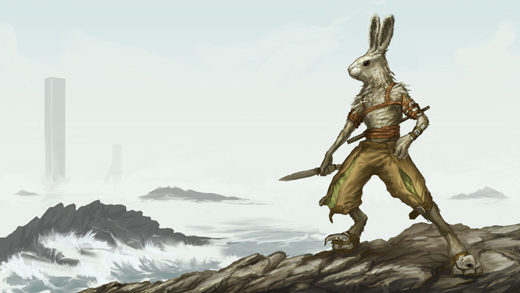 Whenever we have a setting with clear rules, we can reverse them to create interesting exceptions, such as a courageous rabbit who fights back against bigger and fiercer creatures. It is a lot more feasible for us to render animal characters than to render human characters, since we can sidestep the uncanny valley. We spend a lot of time looking at other humans in our day to day life, so we can easily spot tiny errors in a computer-generated human face. However, we spend very little time looking at anthropomorphic animals. This gives us a much larger margin of error to work with before the characters start to look 'wrong'. Animals also have physical differences that are easier to convey quickly to players from a distance. The different species all have different sizes and silhouettes, and different characters within each species have different fur colors and patterns. This is very useful in a third-person fighting game, because enemy characters are often very small on the screen, and would be hard to identify with more subtle distinctions. The big game companies tend to stick with tried-and-true characters like gangsters, space marines, world war two soldiers, ninjas, and barbarian heroes. These characters have proven very popular in the past, so they are re-used over and over. Maybe this is just inertia, or maybe those are really the only reasonable choices. What do you think? Should we keep using animal characters in Overgrowth, or switch to something else?